I can't think of a better quote to make my point about one of the wine worlds most misunderstood and under appreciated wines; German Riesling. If you consider yourself a foodie; than you simply cannot dine well unless you have German Riesling in your cellar;at the ready to help punctuate the certain dining experiences. Once a hugely misunderstood white wine that had trouble shaking it's white-nun habit; today's savvy wine consumer has put German wines back in its rightful place as one of the great food pairing wonders of the world. These wines make excellent pairing partners with recipes that include pork, spicy dishes, schnitzel and even sweet ingredients such as fruit. The wines of Germany are nearly unique in the world-of-wine; German wines are light in body, alcohol and have just a touch of sweetness [clean, light and graceful]. 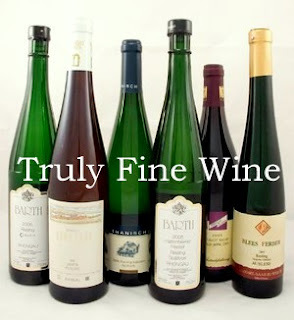 There is also a movement afoot to replace many of the off-dry styles with more dry-as-a-bone styles of Riesling and they're really beginning to make a splash on wine store shelves. Thus many folks are starting to recognize and embrace it as an ideal wine for social occasions, as brilliant choice as an aperitif as well as a fantastic food pairing partner. That said, where in San Diego do you go to get a great bottle of German Wine? Good question and one I answer for you today in my "About San Diego" segment. The place I go is kind of tucked away in a small business park, a place many San Diegans drive-by on their way to the Costco on Morena Blvd, if you blinked too fast you'd drive right by it. In my mind it's my go-to destination for getting my German Wine fix and after a visit I think it will become yours as well. It's a great little shop called Truly Fine Wine. Importers, Wholesale and also retailers of fantastic age-worthy German wines. They have a great selection of German wines, whether you want it sweet or you want it bone-dry they have something for everyone and all occasions. Stop by and talk with Damon, he's a great guy; extremely knowledgeable about German Wines and all wine in general. If you do stop by, please let them know that Mr.Cuvee sent you. Until next time folks sip long and prosper, cheers!